Provide me question paper with answers for preparation of various bank recruitment exams ? 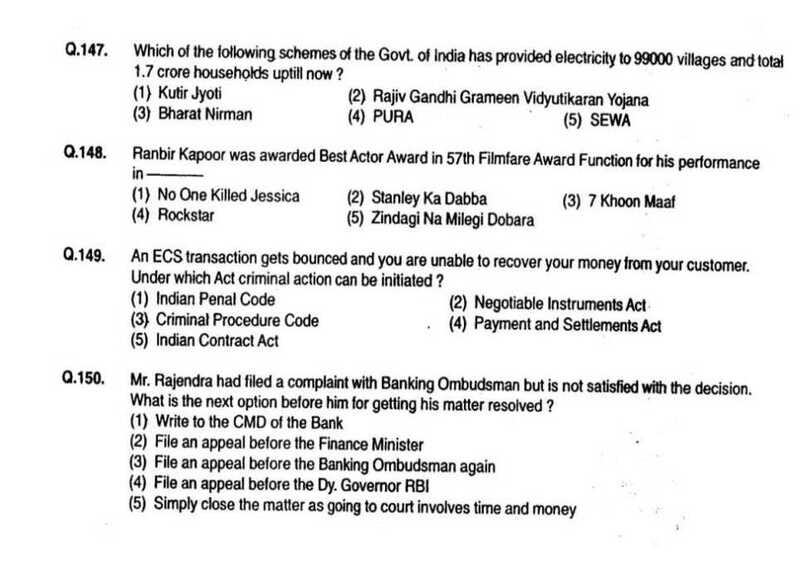 Here I am giving you question paper with answers for preparation of various bank recruitment exams in file attached with it so you can get it easily..
1.Who is the new Prime Minister of Hungry ? 2.Who is the new prime minister of Denmark ? 4.Umrao Singh has passed away recently .Which of the following field was he associated with ? 5.Vidya Pillai is related to which sport ? 6.Who has become the first Indian to win two medal in a Shooting World Cup? 7.Which country has launched a navigational Satellite? 8.Where will be held the Final of the Cricket World Cup 2011? 9.When is the Commonwealth Day celebrated? 10.What is the full form of PTC ? Last edited by Aakashd; August 13th, 2018 at 12:02 PM. Hey buddy I’m Satish preparing for the bank exams for that will you please provide me General Awareness Questions paper with answers so that I can go through it? Feel free buddy I will help you here to get the General Awareness Questions paper with answers so that you can prepare well for the bank exam. 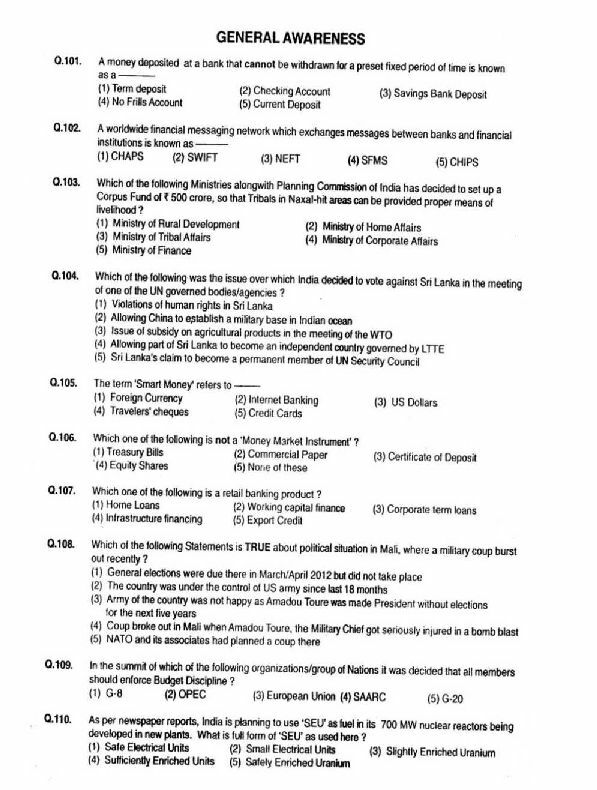 Here is the General Awareness question paper with answer for the bank exam. 1) Ascending size from right to left while the first three alpha - numeric characters (prefix) will remain constant in size. 2) Ascending size from left to right while the first five alpha-numeric characters (prefix) will remain constant in size. 3) Descending size from left to right while the first three alpha-numeric characters (prefix) will remain constant in size. 4) Ascending size from left to right while the first three alpha - numeric characters (prefix) will remain constant in size. 5. New Rs.50 bank note will have ......... printed on the reverse. 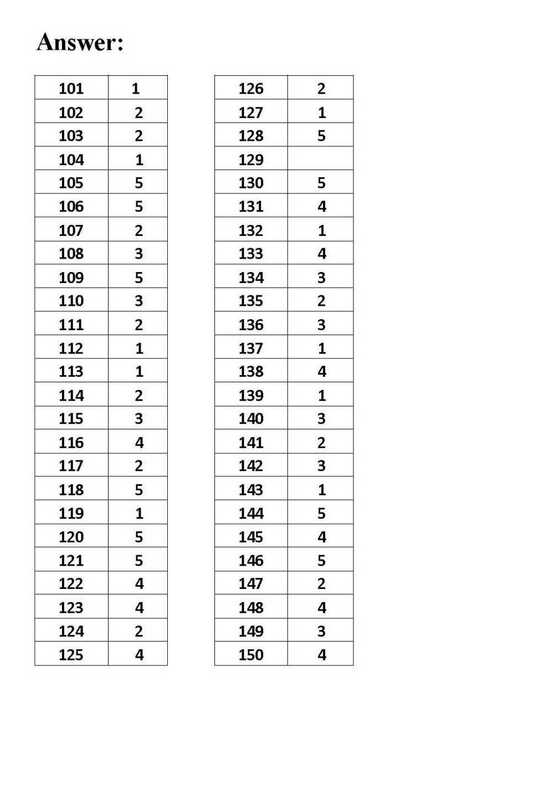 1) Descending size of numerals in the number panels, bleed lines, and enlarged identification mark. 2) Descending size of alphabets in the number panels, bleed lines, and enlarged identification mark. 3) Ascending size of numerals in the number panels, bleed lines, and enlarged identification mark. 4) Ascending size of alphabets in the number panels, bleed lines, and enlarged identification mark. 5) Zero size of numerals in the number panels, bleed lines, and enlarged identification mark. 7. As stated on 22 September 2015, which features are introduced for the benefit of visually impaired persons in the denominations of Rs.500 and Rs.1000 that will be issued shortly? 1) Rs.500 denomination will have five angular bleed lines in three sets of 2-1-2 lines on the obverse in both, the upper left and the right hand edge of the banknote. 2) Rs.1000 banknotes will have six angular bleed lines in four sets of 1-2-2-1 lines on the obverse in both, the upper left and right hand edge of the banknotes. 3) Rs.500 denomination will have four angular bleed lines in three sets of 2-2 lines on the obverse in both, the upper left and the right hand edge of the banknote. 8. Reserve Bank of India's Monetary Museum unveiled a special display on Mysore Coins on August 20, 2015. Where is RBI Monetary Museum? 9. What reason told by RBI Governor Raghuram Rajan on 18 September 2015 for not issuing the high denomination currency above Rs.1000 bank note presently? 1) Cost of high denomination notes are more. 2) World Bank not accepting to mint higher denomination above Rs.1000. 4) Finance minister warned RBI not to mint higher denomination. 5) None of the above statement is correct statement. 10. RBI declared it has withdrawn the instructions on compensation to banks at ........... of the notional value of counterfeit notes detected. 11. The RBI doubles Limits of Cash Withdrawal at POS for Tier III to VI Centres on 27 August 2015. Locate the correct statement regarding this. 1) RBI doubled the limit for cash withdrawal at point-of-sale (POS) in Tier III to VI centres from Rs.1000/- to Rs.2000/- per day. 2) The cash withdrawal limit remains unchanged at Rs.1000/- per day at Tier I and II centres. 4) In 2013 this facility was extended to prepaid cards issued by the banks. 12. Which bank accredited by the Green Climate Fund as an implementing entity for climate change-related projects in India? 18. SEBI on 22 September 2015 imposed a penalty of Rs.7269.5 crore, the biggest in its history on which company and its four directors for illegal and fraudulent mobilization of funds from the public? 20. 2015 United Nations Climate Change Conference (UNCCC), COP21 or CMP11 from 30 November to 11 December 2015 will be held at.....? 21. G-4 summit pressed for the UNO Security Council Reforms on 26 September 2015 held at New York. Which of the following nation is not one of the members of G-4 seeking the permanent membership in security council of UNO? 23. Which among the following indigenously developed second generation anti-tank guided missile, successfully test fired on 10 September 2015? 1) You also become old so respect them. 2) Protect the old age people to allow them to survive. 3) Here are the guidelines for respect of old age person. 4) Your care sees your care in the future. 5) Sustainability and age inclusiveness in the urban environment. 29. World's 20 largest economies, including India, on 6 September 2015 launched W20, an engagement grouping of women leaders, to push for gender inclusive global economic growth at?